This is a spicy kind of lumpia made with green chili peppers stuffed with ground meat with cheese and wrapped with lumpia or springroll wrapper. 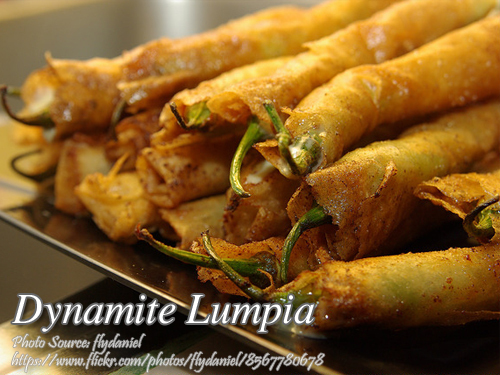 A great appetizer or “pulutan” for those who loves spicy foods. It can be served as an appetizer or viand with hot steaming rice and of course with a dipping sauce. I think the name of this appetizer “dynamite lumpia” is already obvious because it is spicy hot and made with stuffed green chili peppers but sometimes you can buy them not spicy at all. Sometimes it amazes me why some of those green chilies are not spicy and taste like bell peppers. And about the meat used in making the stuffing, you can either choose between ground pork or ground beef whichever is affordable and practical for you. I think you can also use canned corned tuna or ground chicken instead of read meat or just plain cheese sticks if you want a quick and simple dynamite lumpia. Using a sharp knife, slit across the green chili from the stem down to the tip. Remove the seeds and pith by scraping using a small spoon. Be sure no seeds are left so that it won't become too spicy. In a cooking pan, heat a tablespoon of oil and saute the garlic and onion until the onions are soft. Add the ground meat and saute until it changes the color. Then add salt and pepper and saute until cooked. Transfer in bowl and set aside to cool. Stuff each chili pepper with the meat mixture. Then on a clean table or a large plate lay flat a lumpia wrapper and place a stuffed chili pepper. Place a piece of cheese on the stuffed chili pepper on top of the meat mixture. Wrap the chili pepper with the lumpia wrapper with the stem sticking out on one side of the lumpia. Roll the lumpia tightly and seal the edge with a dab of water or brush with beaten egg. Do the same procedure on the rest of the chilies and wrappers. Using a wok or a deep frying pan, heat oil just enough to deep fry the lumpia. Fry them in batches until golden brown or crisp, approximately 3 to 5 minutes in medium heat. Serve with sweet chili sauce or catsup mixed with mayonnaise.